reference design development, NUC and other areas to be discussed later. included with the specific product. based on platform performance and power needs. black design with a theme similar to the Haswell CPU package. damaged while carrying the box. an additional cool accessory free of cost. On/Off and Reset switches near the memory slots. 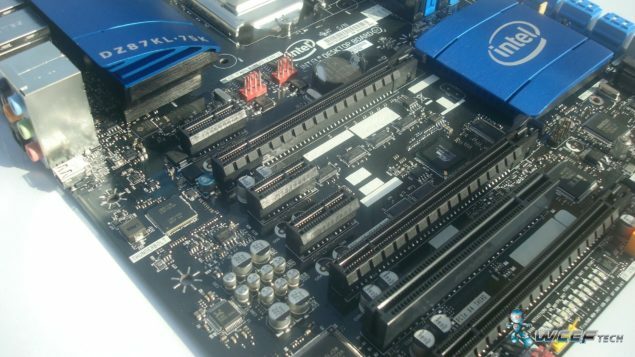 The motherboard comes with 6 native SATA 6 GB/s ports and two SATA 3 GB/s ports. The motherboard supports Raid 0,1,5,10 modes. SSDs. There are two Debug LEDs located beneath the motherboard. most efficient state. It also tells the status of the VRMs through LEDs. 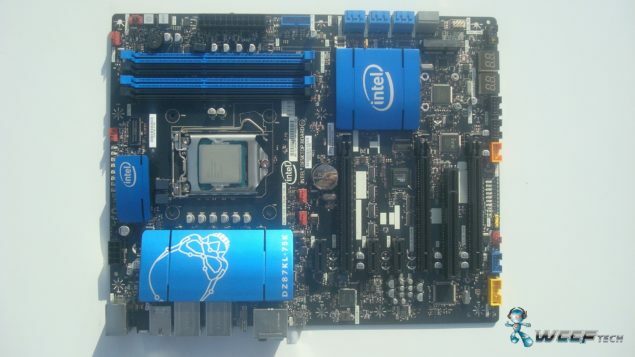 Support for the 4th Generation Intel Core i7 and Core i5 processors in LGA 1150 package. 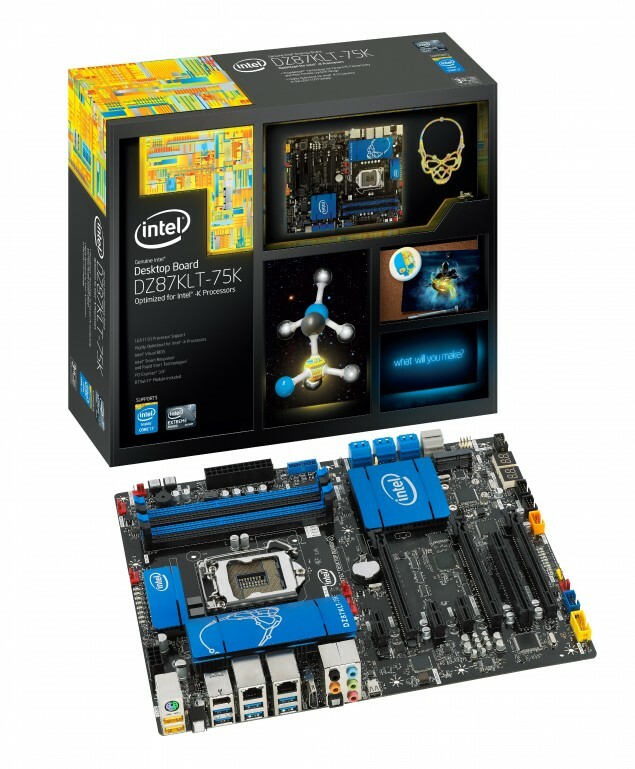 Intel Z87 Express Chipset: Features Intel Smart Response Technology. Thunderbolt connector: Providing revolutionary I/O technology with 10 GB/s bi direction dual protocol interface. 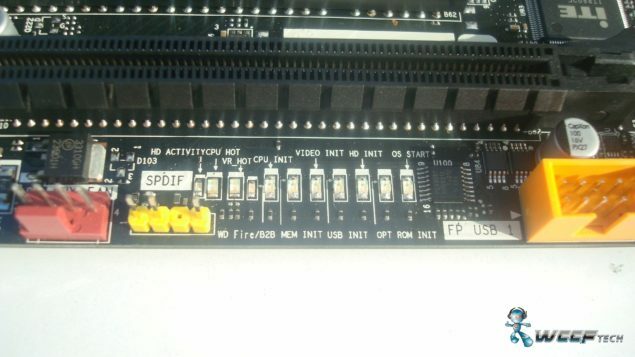 Four DIMM slots: Designed to support overclocked DDR3 2400+ O.C memory with XMP Support. Eight Super-Speed USB 3.0 ports (6 External, 2 Internal header), two IEEE 1394a, 8 Hi-Speed USB 2.0 ports. Two PCI Express 3.0 x16 slots: Support CrossFireX and SLI. One HDMI 1.4a port and 1 PCI-e 2.0 x16 (electrical x4). Three PCI Express 2.0 x1 and one PCI connector: Flexibility to support PCI Express and Legacy PCI devices. 7 SATA 6.0 GB/s ports and one full length PCI-e Mini card supporting mSATA SSD capability via PCH. Intel RST. Separate SATA 6.0 GB/s controller adding two additional ports. Intel Smart Response and Intel Rapid State technologies support: Provide SSD like performance with HDDs. (8+2) 10 Channel Intel High Definition Audio (7.1): Enables high quality integrated Audio. Dual Intel Gigabit Ethernet LAN: Features onboard 10/100/1000 MB/s Ethernet LAN connectivity. Consumer Infrared: Supports receiving and learning IR commands. 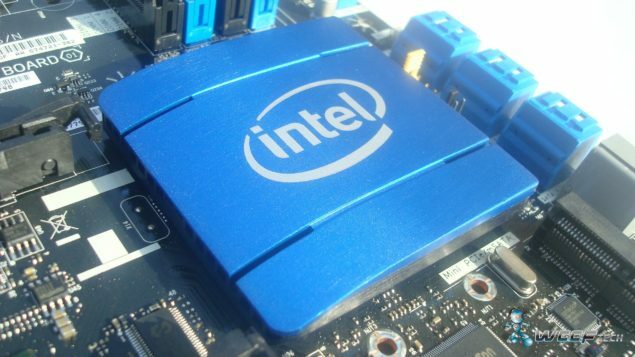 Back-to-BIOS switch: Allows easy access to BIOS for easy overclocking and recovery. Post Code Decoder: Allows for display of post codes for debug along with included post code quick reference. Exclusive voltage regulator heatsinks: Provide reliable and silent cooling for extreme core, GPU and mem tuning. Initialization and diagnostic LEDs: Provides instant visible system feedback. 100% solid state capacitors and exclusive power supervisor: Maximizes power and stability for advanced tuning. ATX (9.6″ x 11.6″) Form Factor: ATX board supports more fully featured tower designs. Lead Free: Meets all worldwide regulatory requirements for lead-free manufacturing. reference LGA 1150 boxed coolers and custom products. power settings section in Visual BIOS.